This game is gorgeous to look at. 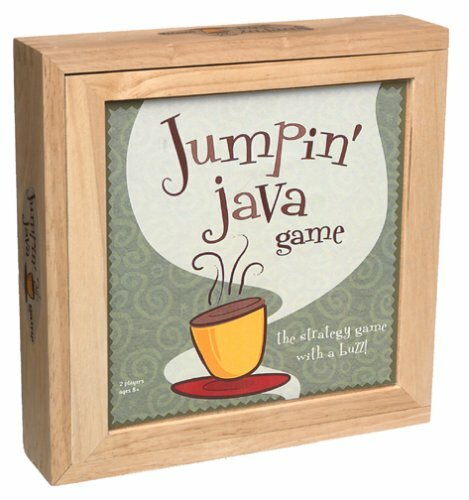 The box is smooth, sturdy wood, the game pieces are red and yellow cups and saucers, and the game board is a column of sage green and brown coasters, linked together with green grosgrain ribbon. It's a strategy game for two players. Each starts with his cups and saucers on his own side of the board, and the object is to get them, cup on top of saucer, to the opposite side. This is done by either sliding or hopping to the first empty coaster. Cups and saucers move independently, and they can only move forward, so if a player thoughtlessly moves his saucerless cup to the last spot, he can't win. This would make a dandy gift for your favorite coffee enthusiast, but young kids like it too. Fun, unusual, and really good-looking game; some may even like displaying it.